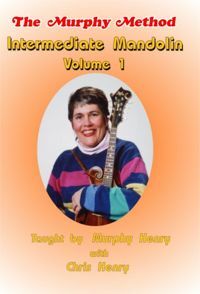 Intermediate Mandolin Volume 1: So you’re enjoying the mandolin! But now you need to know more tunes and you want to learn those “chop” chords you see everybody doing. We’ve got both for you right here. We provide an extensive lesson on three- and four-finger chords and the movable chords positions. Knowing this will allow you to chord along in any key. We also teach five well-known bluegrass standards note-by-note. Guest teacher Chris Henry makes his first appearance as a teacher with “Shenandoah Breakdown.” No Tab.